Heater560 now has a API 530 tool which calculates the required tube thickness in seconds! API 530 is a common industry standard used for determining the appropriate thickness required for process tubes in fired heaters. 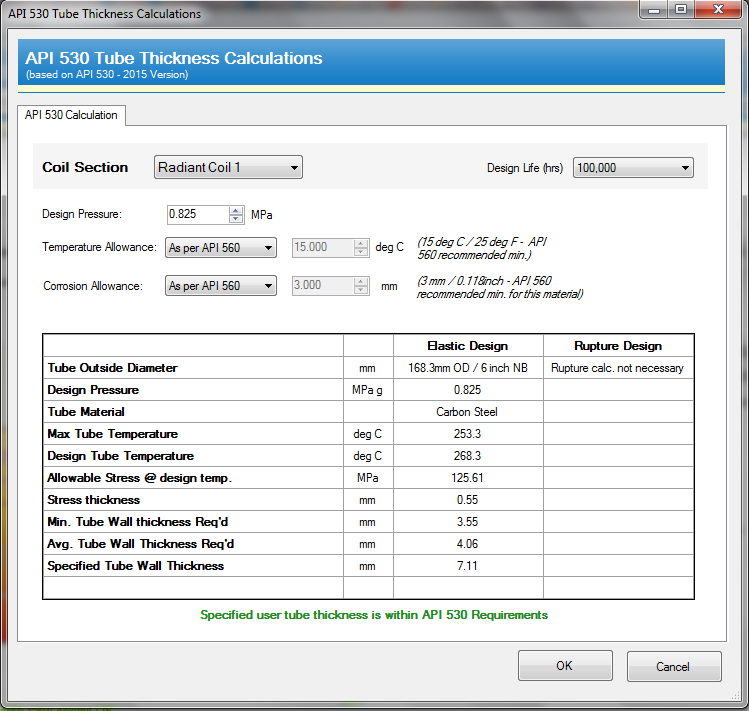 This new feature within Heater560 now enables process engineers to instantly determine the required tube thickness for fired heater coils in accordance with API 530 Standards. This feature saves a huge amount of time for process engineers and mechanical engineers, whether within specialist fired heater companies, EPCs or Operator companies. This tool has the flexibility to operate in Automatic or Manual mode and provides engineers with the flexibility to adjust the main parameters such as 'Temperature', 'Pressure', 'Corrosion Allowance' and 'Design Life (hrs)'. This tool is just another powerful feature within the Heater560 softwarehich has dramatically enhanced fired heater simulation tools for process engineers.